LILONGWE, Mar 20 2013 (IPS) - Malawi’s first-ever tripartite elections in May 2014 will be a litmus test for President Joyce Banda, who is faced with an opposition majority in parliament, soaring food prices, and a potential treason trial. The charging of 12 top Malawian government officials with treason may be a catalyst for more unrest and a recipe for disaster for Banda as soaring food prices are set to impact over 65 percent of Malawians this year. “Those who blame Joyce Banda for the food shortages and the high (food) prices will easily join in and use the arrests to ferment their anger towards her government leading to the elections next year,” independent political commentator John Phiri told IPS. Banda, the country’s first female president, will seek re-election next year. She took over the role after her predecessor, President Bingu wa Mutharika, collapsed and died on Apr. 5, 2012. She heads the governing People’s Party (PP). However, on Mar. 11 she ordered the arrests of 12 government officials, including Peter Mutharika, the late president’s younger brother, and Minister of Economy and Planning Goodall Gondwe, a former vice president of the International Monetary Fund. Gondwe has since resigned from his post as minister. The accused, who were released on bail on Mar. 14, have been charged with seven counts of treason, inciting mutiny, conspiracy to commit a felony, breach of trust, and giving false evidence to the Commission of Inquiry into President Mutharika’s death. The Commission of Inquiry report found the accused guilty of conspiring to prevent Banda’s ascendance to the presidency. The inquiry also found that they allegedly tried to convince the Army Commander of the Malawi Defence Forces, General Henry Odillo, to take over the country. Odillo had refused as the request was against the country’s constitution, which calls for the vice president to assume power in the event of the death of a sitting president. 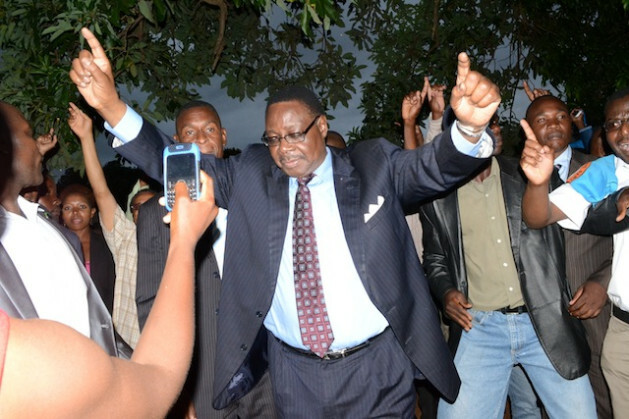 However, the arrests of the government officials sparked protests in Lilongwe and Blantyre, and the former ruling Democratic Progressive Party (DPP), which is headed by Peter Mutharika, is already using this to pressure the government to drop the treason case. “President Banda should focus on the suffering of many Malawians who cannot get food or medicines in hospital, and not on arresting Peter to stop him at all costs from contesting the 2014 tripartite elections,” DPP spokesman Nicolaus Dausi told IPS. “Such actions breed violence and she will be blamed if things get worse,” Dausi said. The latest data from the Centre for Social Concern, a local research institution focusing on the cost of living in urban Malawi, showed that since Banda took over, a family of six now needs an average of 200 dollars per month to meet basic food demands. In a country where the minimum monthly wage is about 20 dollars, it has left many unhappy with Banda’s austerity policies. Charles Mlombwa, a vendor and DPP supporter, warned of more protests if Peter Mutharika was prevented from participating in the next election. “I support late President Bingu wa Mutharika’s party … because I know that many things are wrong and this government has failed,” Mlombwa told IPS. In urban centres women have been sleeping outside Admarcs, government grain markets, waiting to buy cheap maize. Reports of women fainting from hunger in queues have become the story of the day here. Many here blame Banda for the maize shortage. On Mar. 13 the Consumer Association of Malawi accused her of emptying the country’s silos of maize and distributing it to the poor for free. The association claimed that much of the maize Banda was distributing was meant for sale at the Admarc markets. Elizabeth Gama, a mother of seven, has been travelling over 70 kilometres every day from her home on the outskirts of Lilongwe to the nearest Admarc. “There is no maize in the Admarc markets and when I find it, I am only allowed to buy 15 kilogrammes per person, and yet the president is busy distributing maize for free across the country,” Gama told IPS. Mphatso Katuli, a mother of four who said she had been sleeping outside an Admarc depot for the last three days waiting for maize, was also unhappy with Banda’s regime. “During President Bingu wa Mutharika’s time all of this (did not happen) because we had enough maize and Admarc markets were well stocked then,” she told IPS. Meanwhile, Augustine Magolowondo, the Africa regional programme coordinator for the Netherlands Institute for Multi-Party Democracy, feared that the treason arrests were likely to fuel unrest in the country. “It is apparent that these arrests have created an environment of tension in the country and the reaction of the supporters when their leaders were arrested cannot simply be wished away…under such circumstances, conflicts are bound to arise,” he told IPS. Ophamally Makande, the spokesman for the PP, defended the arrests. “This government is only trying to promote a culture of accountability and the arrests, therefore, are justifiable because people need to know what happened to their president (Bingu wa Mutharika) and why they wanted to stop President Banda from taking over,” Makande told IPS.